We have had some very strong showers over the region during the past six hours and particularly in a convergence zone over the north Sound and eastern Strait of Juan de Fuca (check out recent radar above). It is really pouring in some locations. 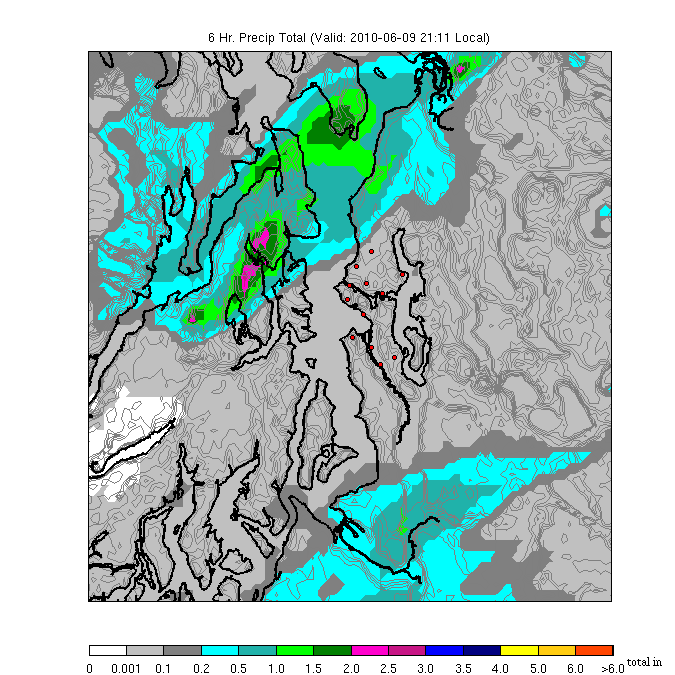 Take a look at the last 6-h rainfall from the Seattle rainwatch web site (www.atmos.washington.edu/SPU). Some locations on the Kitsap and near Marysville have gotten TWO to THREE inches over the last six hours. 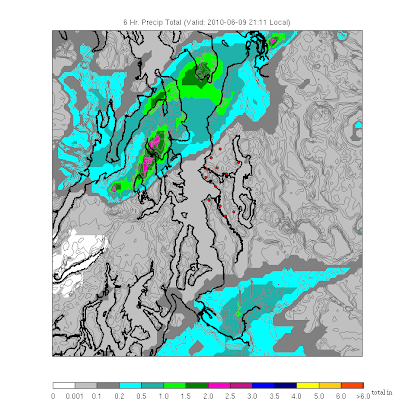 I would not be surprised if there was some street or urban flooding in these places (this is what Rainwatch, funded by Seattle's Public Utilities, was designed to help show). An other heavy rain band struck Tacoma and the south Sound. Not as much action in between due to rainshadowing in the lee of the Olympics. Now there are some people who make fun of weathermen (none of you, of course). But to show you how far we have come...below is forecast made this morning for three hour rainfall ending 11 PM. Compare that against the radar...not perfect, but it got the general idea of that SW-NE band over the N Sound. And, as I noted yesterday, Saturday is still on track to be warm and sunny. Not as good on Sunday.